On February 25, there will be another night of spoken word at The Albion Hotel, Downtown Guelph. So, Polish your Poetry and Perfect your Performance! Bring your piece and offer it to the SLAM! We are all anxious to hear it! You only need one piece (three minutes or less). The spoken word poetry SLAM randomly selects three audience members to judge the poets out of 10. The poet with the highest score out of thirty is the winner! 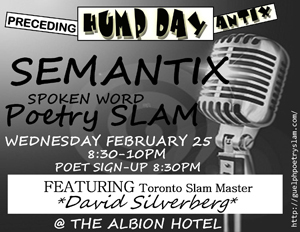 The feature poet for February 25 is Ontario’s very own, Toronto Slam Master, David Silverberg. David Silverberg has been involved in the Canadian spoken word community since 2001. He created Toronto Poetry Slam (TPS), where he currently serves as host and artistic director. He is part of the Toronto poetry troupe Last Call Poets. He has performed across Canada, including Calgary, Halifax, Vancouver, Ottawa, London and Montreal. He is the editor of Canada’s first spoken word anthology, Mic Check (Quattro Press). His most recent book of poetry is Bags of Wires (LyricalMyrical). 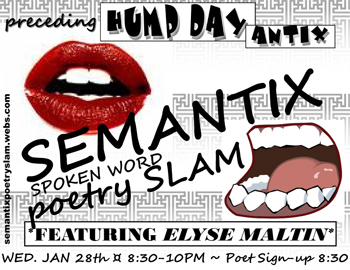 Semantix – the Guelph Spoken Word Poetry SLAM happens the last Wednesday of every month. There are always prizes for the winning poet, an out of town feature performer and lots and lots of fun! Come check it out. Anyone is welcome to perform, judge, or listen. Check out www.guelphpoetryslam.com/video for postings of the performers. A busy show as usual. In the first half, Mike Driscoll joined us in the studio to talk about the 28th Annual Organic Conference. The Guelph Organic Conference “O is for Opportunity”, expo and tasting fair will be taking place from January 22-25 in the University Centre at the University of Guelph. Celebrating its 28th year, the four-day event includes international speakers, seminars and introductory workshops on frontline topics including GMOs, organic production and certification, food in a changing climate,eco-villages, earth buildings, farmland protection and food security. From producer to eater, the workshops offer something for everyone. 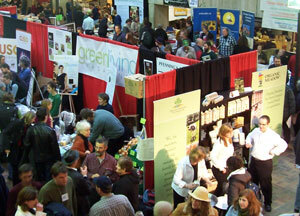 PLUS an Organic Expo and Tasting Fair with 160+ exhibitors on Saturday and Sunday, free to the public. This is your opportunity to sample and purchase a plethora of organic, fair trade products and meet the makers, movers and shakers. To register for the conference and more information, visit www.guelphorganicconf.ca. Later in the show Beth-Anne Fischer came in to talk about the Poetry SLAM taking place at The Albion on January 28 from 8.30 p.m. until 10.00 p.m.
A SLAM is an interactive Spoken Word poetry competition; where poets are judged on their performance and poetry by randomly selected audience members. With one round of competition the SLAM builds with excitement and intensity until a winner is selected. SLAMs encourage audience participation—including cheering, booing and bribing of judges—to sway their point allotment. Poets have 3 minutes to deliver their poetry and 10secs. of grace…. before …. point deductions! During the show we featured the work of several poets. Elyse Maltin a poet from London performed “New Orleans”. Elyse competed in the 2008 Canadian National Poetry SLAM and coordinates a monthly Poetry SLAM in London, Ontario. She will be performing in Guelph on the 28th. A group from Brooklyn performed Climbing Poetry while guest Beth-Anne Fischer slammed live for us in the studio. Great fun! Beth-Anne hopes that the monthly poetry slams at The Albion will become a regular feature on the Guelph Arts Scene. Beth-Anne will also be coordinating a poetry-slam at the Eden Mills Writers Festival fundraiser, “Unlucky in Love?” on February 13 at The Bookshelf E-Bar. Your opportunity to show what you can do! 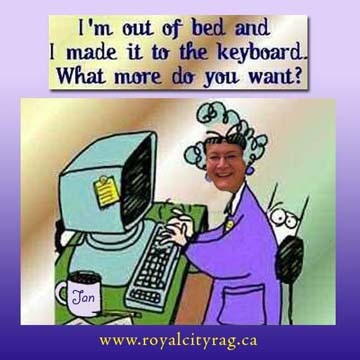 We’ll be devoting the whole of Royal City Rag on February 5 to the fundraiser. With lots of special guests. Don’t miss it!